Babies grow so fast. It can feel like your baby was just born yesterday and suddenly he/she is six months old! As babies grow, they crave constant stimulation. The right toys for a 6-month-old should keep them busy and stimulate their brains as they continue to grow and learn. At this age, babies are curious and want to touch and play with everything around them. Toys can help keep your baby away from items you don’t want them to play with and provide hours of entertainment. This all-in-one toy is both a walker and a learning center for your baby. A colorful panel on the front of the walker can be removed for playtime on the floor, and as your baby grows, they’ll use the walker more and more to take their first steps. The wheels easily roll on carpeted surfaces or hard floors without slipping around. The play panel attaches to the walker, so your baby can play on-the-go. The panel is full of sensory-stimulating fun for babies. The detachable phone handset is the perfect toy for playtime. When baby picks up the headset, he’ll hear animals singing. The swinging door that hides a smiling cow will entertain your baby with endless games of hide-and-seek. The panel has two modes—a learning mode and a music mode. In learning mode, your baby will learn shapes, colors, animals, and more. In music mode, each button pays a new melody, and baby can join in by pressing the piano keys. As your baby learns to walk, he’ll delight in hearing his walker make music and sound as he pushes it around the room. 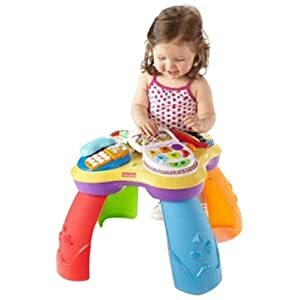 The VTech Sit-to-Stand Learning Walker is an amazing all-in-one, and is sure to provide your baby with all the stimulation he needs to keep his brain growing and learning. 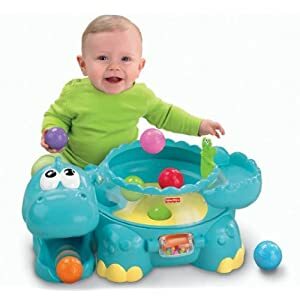 You can use the play panel starting at six months old and your baby can keep playing with the panel and walker all the way up to three years old. This stationary car is just right for a 6-month-old. Baby can sit on the floor inside the car and play with the dashboard. Your baby will love turning the key to “start” the car and pressing the gear-change buttons to make the dashboard light up. The steering wheel has a big yellow smiling face, and babies will love grabbing onto it and pretending to drive. There are over 75 sing-along songs, melodies, and phrases for your baby to discover. When your baby turns on the radio, he’ll learn his ABC’s. Move the windshield wipers on the front of the car to learn all about weather. The door to the car swings open easily, allowing baby to crawl in and out and play all around the car. On the outside of the door, baby can sort three shapes (a circle, triangle, and square). The other side of the car has a ramp to roll around three colorful balls. Three different modes of play make the Fisher-Price Laugh and Learn Crawl Around Car a delight. Switch into learning mode to teach baby shapes, colors, greetings, and more. Turn on music mode for more sensory stimulation, or try imagination mode for playtime. With all the different modes and parts to this car, your baby will enjoy this toy for a long time. 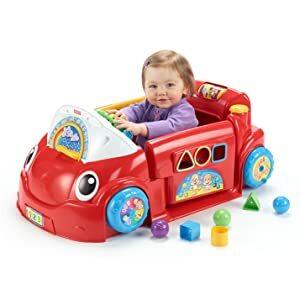 And as they grow, the Laugh and Learn Crawl Around Car will help them sit and stand with support and enhance pretend play time as they imitate driving a car. This car can be used by babies as young as six months old and will still keep most 3-year-olds busy. The Laugh and Learn Crawl Around Car comes in two colors—red and pink. 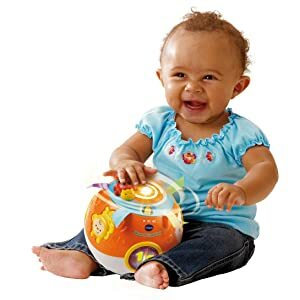 The Vtech Move and Crawl Ball is a whirling ball of fun for babies. The ball is motorized and rolls around the floor on its own. Baby will love watching it go or crawling after it. The bright colors and light-up buttons are eye-catching, and there’s plenty your baby can do with this ball. The three animal buttons and three light-up shape buttons introduce babies to numbers, shapes, and sounds. With over 40 sing-along songs, music, sounds, and phrases, this ball will teach baby all kinds of words. There’s also a volume control for parents who want a little quiet time. In addition to music and sound, the Move and Crawl Ball provides tactile stimulation. The 3D patterns on the ball’s surface and big animal and shape buttons are fun for baby to touch. There are also soft satin ribbons for baby to feel, and a big spinning ladybug on top. As baby gets older, the Move and Crawl Ball will encourage him/her to get moving. The ball moves and rolls all by itself, so baby can chase after it. A special sensor makes the ball wobble around every time your baby makes noise. This interactive element will entertain babies and stimulate their brain. The Move and Crawl Ball comes in two colors, orange and pink. This toy is recommended for babies from six months to 36 months old, and is perfect for this age range as they learn and grow. The Puppy & Friends Learning Table is full of fun and stimulating activities perfect for babies 6 months and older. The table is just the right height for baby to stand up and lean on while playing with all the fun gadgets on top. 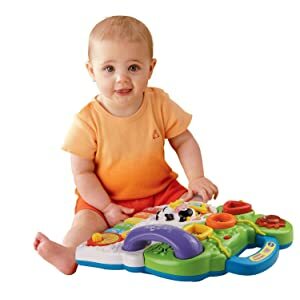 For babies not quite ready to stand, the tabletop can be removed to create a perfect toy for floor playtime. Each corner of the table is its own play center. In one corner, baby can turn the pages of a book to learn their first words. The next corner provides musical stimulation with four colorful piano keys and three black keys, just like a real piano. Then there’s a baby-sized laptop with lots of buttons to push for sounds, words, and music. The fourth corner has a phone with keypad and handset so baby can pretend to talk and hear characters counting. The cute characters really make the Puppy & Friends Learning Table come to life for your baby. Babies will love pressing the buttons and hearing Puppy, Monkey, and Sis talk back to them and teach them shapes and numbers. Over 60 sing-along songs, music, and phrases keep baby entertained. With four learning modes, Puppy & Friends Learning Table is versatile. Try learning mode to help teach baby shapes and numbers. Music mode will stimulate baby’s brain with fun tunes and sing-alongs. Imagination mode lets baby play and have fun with their imagination. The most exciting and innovative mode is the bilingual mode, which helps baby learn basic words and phrases in English and Spanish at the same time. Language-learning is a huge part of growing up, and babies and children can pick up on a second language more easily than adults. The toy is an exciting toy for babies. This friendly blue dinosaur comes with six colorful plastic balls. Put the balls in the space on the dinosaur’s back and watch the fun begin. As the dinosaur plays an upbeat tune, the balls will pop out and go flying. When the balls land on the dinosaur’s tail, they roll back down and come out of his mouth. Babies will love watching the colorful balls pop up in the air. The sensory stimulation of picking up the balls and putting them back, combined with the fun music, will help babies learn and grow as they play. The Poppity Pop Musical Dino is designed so the balls will occasionally fly out and away from the dinosaur. Baby will crawl after the balls to bring them back to the dinosaur. This kind of active play is exactly what babies need to develop. With eight different songs, Poppity Pop Musical Dino keeps babies entertained. The unpredictable popping balls will challenge your baby’s brain as they develop their motor skills by picking up the balls and placing them in the dinosaur. This fun toy is perfect for babies from six months old all the way up to three years old. The Baby Einstein Octoplush combines an interactive learning toy with a super-soft adorable octopus plush toy. This toy provides tactile stimulation with different textures and fabrics. When baby squeezes the Octoplush, they’ll hear classical music play to help stimulate their brain. Your baby will love hugging their octopus and listening to the songs he plays. Each of the Octoplush’s legs help to teach baby a color. Each of his eight legs features a little symbol in a different color. There’s a green leaf, a blue cloud, purple grapes, a brown teddy bear, a white snowflake, red cherries, an orange, and a yellow star. When baby presses on the symbol, the Octoplush says the name of the color. Underneath each tentacle, there’s satin fabric in matching colors to help reinforce color names for baby. To enhance your baby’s learning even more, the Octoplush has three different language modes. Hear Octoplush say each color’s name in English, Spanish, and French. Soon, your baby will know their colors in all three languages. 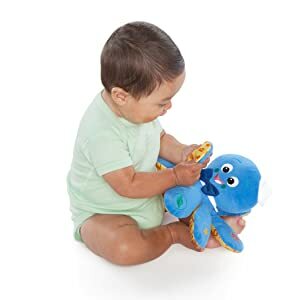 This toy is fun for babies at six months old, and as they begin to talk they’ll pick up on the color names in all three languages. This cuddly, soft octopus is sure to be loved for years to come. When choosing a toy for a baby between six and twelve months, there are a few things to take into consideration. While not all babies develop the same, there are certain milestones that most babies reach around these years. You’ll want to pick a toy that’s developmentally appropriate—something your baby can use easily. For example, you wouldn’t get a 6-month-old a bicycle. Between six and twelve months, babies are developing their motor skills. They learn to sit up on their own and crawl. They start to point at things and reach for things. Babies at this age become fascinated by watching moving objects. By the time your baby is a year old, he’ll be picking things up, putting things in boxes, and putting things in his mouth. This means baby needs lots of tactile stimulation. Babies’ brains also grow tremendously between six and twelve months old. Your baby will know familiar faces and learn to babble and repeat words. Games of peek-a-boo will fascinate your baby. They’ll start imitating the way you use things like a telephone or hair brush. So what does all this mean for playtime? Well, babies between six and twelve months need all kinds of stimulation! Being able to touch different things, hear music, and listen to words and phrases will help your baby grow and learn. Toys that cater to these needs are ideal. This is why so many toys for babies at this age make lots of noise. Even if you find all these noisy toys a bit annoying, you can rest a little easier knowing all that noise is helping your baby develop. The best toys for six to twelve-month-old babies are toys that they can touch and manipulate. Pressing buttons, feeling textures, and seeing a response when they move something will help baby start to make connections. Toys where baby has to put shapes into the right places, for example, are very popular, as they help baby learn shapes and feel them. Toys that talk to your baby are ideal at this age. This is especially true for toys that count, or say shapes and colors. Hearing those words will help baby understand the names of shapes, colors, and numbers. Finally, musical toys are excellent for six to twelve-month-olds. Music will help with baby’s brain development and entertain him/her at the same time. So, you want to look for toys that provide stimulation, teach your baby new words, and play music. Try out a few different learning toys and see what sticks with your baby. Every baby is developing their own personality and will prefer different toys. That’s okay—let them play and have fun. With the right toys, they’ll be learning while they play!